129 High Street, High School Close Dalkeith, Midlothian. 4th Friday - April, at 7.45pm. 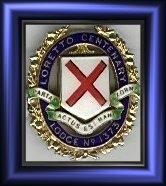 Sponsored by Lodges St.John, Fisherrow No.112 and Lodge Royal Thistle No.1338 so as to provide a Masonic connection with Loretto School - similar to Edinburgh Academy Centenary No.1327 - the Lodge was Consecrated and Dedicated at a Service held on the 12th December 1930. The minute book records two notable characters :- Bro. A.H.Buchanan-Dunlop R.W.Master in 1932 was a former pupil who, following distinguished military careers, twice returned to become a member of teaching staff - and whose name/reputation became synonymous with both School and the Lodge during its formative years. Bro. George Draffen R.W.Master in 1937 was an Affiliate Member of the Lodge - better known as George Draffen of Newington in later life who became one of the foremost Masonic scholars of his generation. Financial problems and lack of support resulted in the Lodge being declared dormant on 31st December 1939. In 1986 support was growing in the Province of Midlothian for the formation of a Lodge of Research and Instruction. Bro. Draffen being the last survivng former member of 1373 readily consented to sign the papers and The Loretto Centenary Lodge No.1373 was reponed on the 12th December 1986 to fulfil that need. Lodge business now combines a series of lectures/presentations with the occasional degree working.